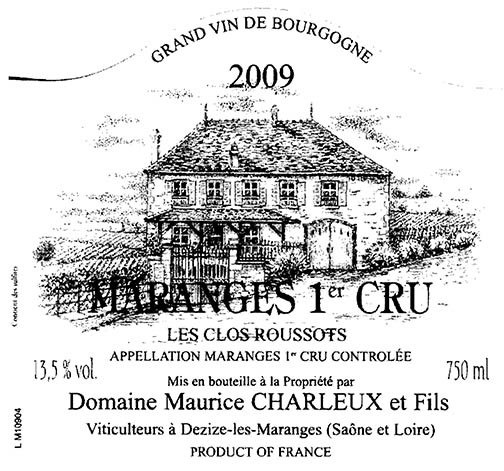 Domaine Maurice Charleux is located in Dezize-les-Maranges, about 4 kilometers southwest of Santenay. It was founded in 1894 by Ferdinand Charleux, who owned just a little over half a hectare (60 acres) of vines. 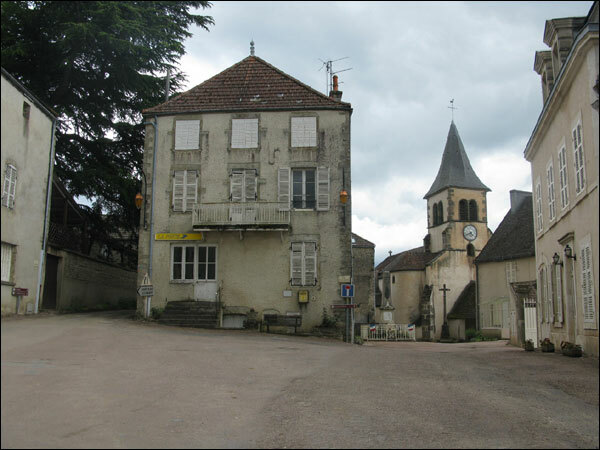 By the time he died in 1924, he had expanded the property to 2 hectares. A few years later, Ferdinand's son Joseph began a 30-year span of growing the size of the property to 8 hectares. Maurice took over the domaine upon his father's retirement in 1970 and began branding the wines under his name. Nearly 20 years later, his son Vincent began working with his father and, little by little, acquired more plots of vines. Today, the domaine covers just under 10 hectares, of which 85% is Pinot Noir and 15% Chardonnay. 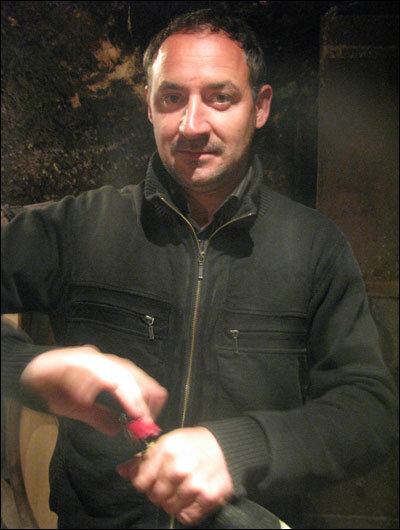 The domaine has an annual production of appproximately 40,000 bottles — a number that is gradually rising. The family still sells a small percentage of their harvest to local négociants. 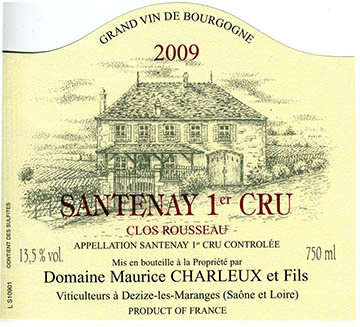 55 hl/ha is authorized for Santenay Blanc, but Charleux averages 52. 50 hl/ha is authorized for Maranges and Santenay, but they average about 44 hl/ha. 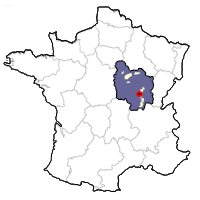 60 hl/ha are permitted for Bourgogne Rouge, yet they are normally in the 50 hl/ha range. That being said, yields between 2011 and 2013 were way down so that over the course of three vintages, they have had the equivalent of only two harvests! The soils on their parcels are clay and limestone, although the percentages vary between the vineyards. The Bourgogne, Maranges VV, and Maranges Premier Cru Les Clos Roussots have a high percentage of clay, while La Fussière, Le Clos des Rois and Santenay have more limestone. Certain parcels are worked with a plow while others, especially when there is danger of erosion, are covered with grass. The Charleux family farms in lutte raisonée, that is sustainably, using copper and sulfur during most of the year while several times of the year they might feel it necessary for the health of their plants to incorporate a synthetic treatment. The family adapts their work to what the climactic conditions demand. They did a green harvest in 2009 but haven't done one since. Harvest is done by hand with the sorting done in the vineyard. The white wines are pressed in a balloon press, allowed 24 hours of skin contact. The wine is then fermented in barrels, 20% new. For the reds, only indigenous yeasts are used. The reds are de-stemmed, then see a 3-5 day cold soak, and a 15-21 day fermentation period in cement tanks or foudres, with punch downs, pump-overs and delestage. The premier cru wines go into oak casks, approximately 20% new. The village wines see about 15% new oak, while the Bourgogne Rouge does not see new oak at all. The family likes keeping oak to a minimum, preferring to let the terroir of each cru surface, rather than be hidden by a "international" style that masks the beauty of each climat. Bottling with a light filtration takes place approximately a year after being in barrel. 1.82 ha. This is the largest climat of Maranges, covering some 35 hectares. It has a south-facing exposure and lies in the middle of the slope at an altitude of 290 to 400 meters. The soil is often white limestone over blue-colored marl, replete with fossils. The Jurassic bedrock lies beneath the cru. This wine comes from 35 to 50 year-old vines, which helps amplify the wines concentration and finesse. ​Food Match: This wine has power as well as elegance, making it a wonderful accompaniment to rabbit, filet mignon and pork tenderloin. 0.51 ha. This vineyard is a direct continuation of Maranges' Clos Roussots, divided only by the Maranges Premier Cru Clos de la Boutières. Vines average 30 years of age, and the oak treatment is in 2nd and 3rd use barrels (with about 15% new oak employed). Food Match: This wine is an excellent accompaniment to coq au vin or beef tenderloin. Tasting Notes: The tannin is a bit more velvety than that of Maranges, and the fruit includes cherry and cassis. With aging, some interesting notes of undergrowth add complexity. 0.30 ha. This cru sits at the bottom of the hill, and includes just over 7 hectares of vines that face south and southwest. The altitude is between 260 and 290 meters. The soil is quite complex but, in general, contains more limestone than La Fussière. Tasting Notes: Wines from this climat have both structure and complexity, and have red fruit aromas along with floral and spicy notes. ​0.50 ha. This comes from 50 year-old vines just outside the Maranges appellation southwest of the winery. It is aged in tank and older barrels. ​Tasting Notes: Medium-bodied and supple, this wine shows red fruit (strawberry, cherry and cassis) and soft, well-integrated tannin. ​2.20 ha. The vines for this cuvée were planted in 1937 and 1933, which gives it admirable concentration and length. Aging takes place in 3rd and 4th use oak casks. ​Food Match: This wine is an excellent accompaniment to coq au vin or beef tenderloin.Tasting Notes: The tannin is a bit more velvety than that of Maranges, and the fruit includes cherry and cassis. With aging, some interesting notes of undergrowth add complexity. 2.14 ha. This climat contains just under 26 hectares of vines planted at 260 to 315 meters that face south and southeast. These vineyards are less pitched than La Fussière. Soils are blue colored clay/marl mixed with limestone debris. Tasting Notes: Normally forward and full of little red fruits, particularly raspberry, this wine also has attractive lashings of vanilla and spice.